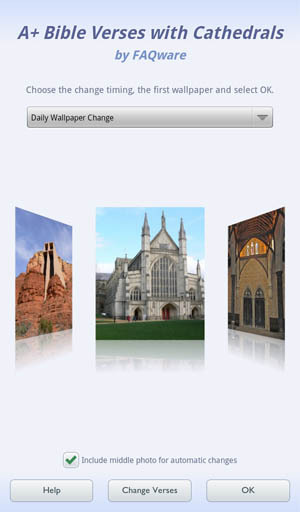 Get your daily Bible verses on top of great photos with our Wallpaper app in the Nook Marketplace! 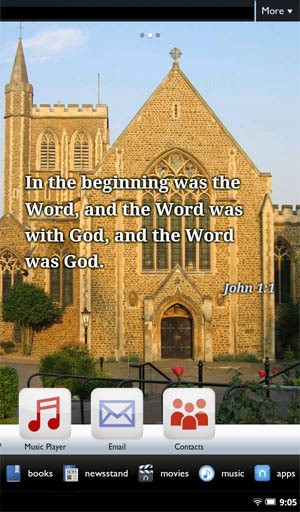 Daily Bible verses with cathedral, chapel and church photos! 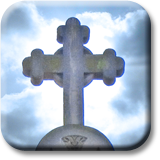 Choose from 70 inspiring verses of faith, joy, prayer and more from the Updated King James Version, World English Bible, or The Sacred Bible, Catholic translation. Select from 20 photos optimized specifically for the device's HD screen and two bonus high-contrast photos. Automatically changes verse and photo weekly, daily, hourly or do it yourself anytime with a swipe. Enjoy personalizing your home and lock screens with Bible verses and photos! Customers also love our Beaches and Sunsets Wallpapers. Install Wallpapers via the device�s Wallpaper Dialog. Touch a blank area of the home screen for a few seconds. Now, select the Live Wallpaper tab and tap the A+ Bible Verses choice. A preview screen appears. Press the Set Wallpaper button (at the bottom) to start your new wallpaper. It's preset to change to a new UKJV verse and photo daily. Personalize how often photos and verses change, start, and which ones to include or exclude. Start with steps 1 and 2 above to get to the preview screen. A drop-down menu near the top lets you choose when photos and verses change or if you prefer, no automatic change. Select a timing option. To exclude the current photo in the timed change, un-check the box Include middle photo for automatic changes. When satisfied with your options, press the OK button.